Today wasn't a particularly sunny day, unless you were talking about "Shade Palmetto Bay", a green event that allowed residents to take home a tree to beautify the Village. 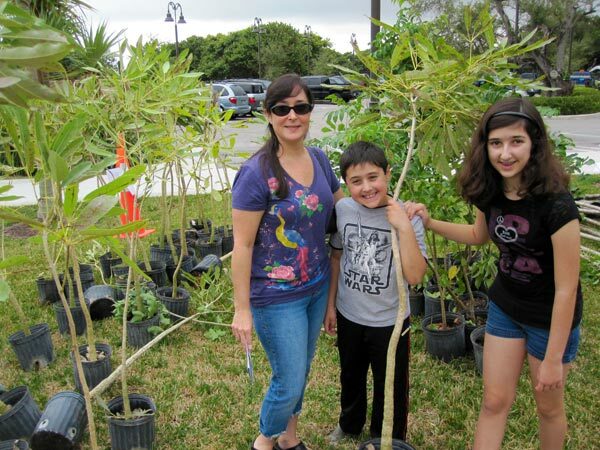 It was all part of Day 2 of Palmetto Bay's celebration of Arbor Day. Starting at 10:00AM, residents were encouraged to come down to Ludovici Park and pick out a tree from about six varieties. The only thing they needed to do was flash identification that proved they were Palmetto Bay residents. Many Parks workers members were on hand, as well as Village officials and staffers. Thanks to the sponsors (Groundkeepers, Inc., Santa Barbara Nursery, and Ramada Nursery), over 300 trees were made available, varying in size from grab-and-go to load with forklift. Some green citizens even took their new trees away on bicycle. My family found a beautiful young sapling that should grow to provide nice shade and yellow flowers during budding season. Besides making the future of Palmetto Bay, a Tree City USA participating municipality, more beautiful and green, it allowed residents to engage in friendly conversation and enjoy our park resources. When we got home, it also allowed me and my son to work up a good sweat and get some exercise digging a welcome new home for our tree. Once again, Palmetto Bay does its citizens proud. Check back with us in a few years and we'll pour you a lemonade under our great shade tree.